Through womanhood preparing, 'neath faith's transforming rays. In our hearts now and ever there's a place that you hold. I'm proud to have been a 'Convent Girl.' Even prouder to say, I hail from the days of principal Sister Marie Claire Joseph. Sister Claire was a Trinidadian and supposedly sister to calypsonian Crazy. On arriving into St. Lucia in 1973, Sister Claire started off as a graduate teacher at the St. Joseph’s Convent, in English Language, Literature and Art. In 1982 she was appointed as principal of the school and continued to serve in that capacity even after her official retirement in 1994 (I graduated that year). Nineteen years later, I still follow lessons she taught, "Always keep your kitchen and bathroom clean." She explained that these were the two areas in your home that spoke volumes about your cleanliness. She would stand on the assembly hall stage and was able to name any one of her 720 students to toe the line. She had even toggled my left earlobe when I decided to jump on a faster moving line into the hall. I can also remember her frustratingly shouting "ninny headed nincompoops!" Sister Rufina on the other hand was a teacher either bouncing around on the upper level outdoor court and adult leader of the Girl Guides. Rather playful. Fast forward to 2013, Sister Rufina is now SJC's principal and has our school participate in a reality show, Extreme School. .... And at the sixteen minute mark, oh wonderful Sister Claire makes an appearance. Ahh that voice brings back warm memories. .. And from the looks of it, SJC is still whipping young girls into shape with its discipline! LOL! 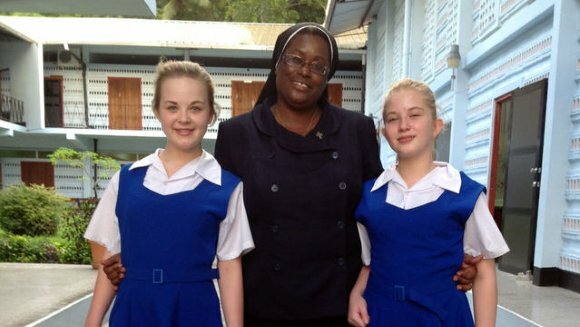 Two Year Nine girls from Newcastle with a bad attitude to education sign up for a stint at St Joseph's Covent in St Lucia for a week to see if they can change their ways. The girls' total lack of interest in school shock the tough talking Principal Sister Rufina and they soon realise that they may have finally met their match. Facing strict uniform rules and a no-make up policy, life at the convent is very different to school in Newcastle. The girls struggle to see the point of learning good manners and etiquette which is a must for every convent girl. But they do take on the convent school's community spirit, helping out at an underprivileged school and an afternoon at the pre-school, where the children are a law unto themselves. Will it give the girls a taste of their own medicine?